one seeing, one knowing and one love. Faith, as distinguished from mere credulity, is both a gift from the All-Compassionate and an exercise of spiritual imagination that is rooted in transcendent reality. It is “the evidence of things not seen” (Hebrews 11:1), yet it is not blind, but is rather the intuited awareness and acceptance of the very ground of our being, our primordial nature, the heart through whose eye all is seen. Thus it embraces and engages the complete being. In a celebrated hadith, the Prophet of Islam defined iman (faith) as “a knowledge in the heart, a voicing with the tongue, and an activity with the limbs”. Faith is thus the foundation of all ontological growth, the rock upon which rests the ladder that ascends to heaven. The intellect, as distinguished from mere rationality, is the “eye of the heart”, the highest cognitive faculty in man, once the “doors of perception are cleansed”. It is “Eckhart’s eye”, whose supra-rational cognition is visionary or darshanic, direct and experiential, the sacramental convergence of knowledge and being in love (“one seeing, one knowing and one love”). The intellect, however, is an aspect of faith, being like faith an exercise of spiritual imagination that is rooted in transcendent reality. Thus it is said that “spiritual knowledge is born from faith” (St. Theodoros the Great Ascetic). To put it differently, the birth of meaning is an act of faith. Faith can also be understood as the mystery of intimacy, and intellect as the intimacy of mystery. This view derives from the traditional perspective in which reality is both manifest and hidden, proximate and distant, immanent and transcendent, and is therefore both intimate and mysterious. Based on this duality, faith is the yin element that represents our receptivity to the mystery of transcendence, while the intellect is the yang element that represents our access to the intimacy of immanence. To pursue this symbolism, as in the traditional yin-yang symbol, where each element is present within the other, faith also contains an actively receptive element that links it to the intellect, while the intellect also contains a passively receptive element that resonates with revelation, in a universal sense. Mystery and intimacy are thereby intertwined. Listen to the story told by the reed, of being separated. “Since I was cut from the reed-bed,I have made this crying sound. Anyone apart from someone he loves understands what I say. Only by becoming hollow (empty of self through submission to the Divine Will) can the reed-pipe sound its plaint of love as the Breath of its Maker (the Breath of Compassion, nafas rahmani) blows through it again, thereby re-creating its achingly beautiful melody of love in an act of mysterious intimacy. Through such sweet surrender, faith experiences Truth as Presence and develops the existential certitude that the transcendent essence of our existence is nothing less than divine. The intellect, by contrast, is the repository of the transcendent foreknowledge of this truth (aletheia, suggesting “not forgetting” or awareness), inscribed within our hearts and recollected – by grace – in moments of tranquility. This recollection (anamnesis or “re-minding”) is the intimate access of our deepest perception into the mysterious heart of transcendence. The relationship between faith and intellect can also be understood in terms of the relationship between communion and sacrament: the pining for mysterious intimacy through communion and the intimate recollection of mystery through sacrament. Faith proceeds from the intimate center or “heart” of our being and is rooted in communion, while the intellect is a relationship to the mysteries of revelation, interpreted by the “eye of the heart” sacramentally. At its highest level, faith functions as the intellect through its openness to the intimacy of immanence. This openness to intimacy is the source of our awareness of our communion with the Divine, that the spiritual substance of our innermost heart is itself divine and is thereby the source of our certitude and felicity. Correspondingly, at its highest level, the intellect functions as faith through its openness to the mystery of transcendence. This openness to mystery is the source of our awareness of the sacramental nature of creation as a continual revelation, that each moment and every atom is a unique and sacred radiance of the Divine, “the Truth whose theophanies are never repeated” (Nasr). The openness to both mystery and intimacy gives rise in various traditions to certain spiritual gestures or mudras by which faith and intellect can be depicted. Faith is the upward-facing open palm (turned toward heaven) that receives the blessings and bounties of Mercy. It is an attitude of readiness, not expectancy, for expectancy negates the privilege of grace. Its role is “to make a void for the passage of God”. This corresponds to humanity’s indigence in the face of the divine. Yet man is not merely abd (slave or creature) in relation to the Creator but also khalifa (vicegerant or steward). Through the intellect, man is pontifex, the prototype of the divine, latently endowed with the wealth of sacred knowledge, a supernal gift which man is entrusted to use wisely (see Qur’an 33:72 and 4:58). The intellect, then, is the instrument by which this latent sacred knowledge can be accessed for the stewardship of all creatures. To continue the symbolism of spiritual gestures, the intellect is depicted as the downward-facing open palm (turned bodhisattvically toward the world) that becomes a sacred passage for the flow of the gifts of the Bounteous which It directs through Its innate sense of Justice and Mercy. Receiving and giving, humility and charity, submitting to the Divine Will and being the Trustee of the Divine – these are the mudras of faith and intellect. 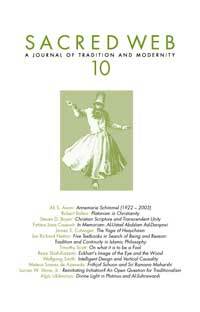 Thus, in the Mevlevi Sufi tradition, the celebrated figure of the Whirling Dervish in the sacred sama embodies these same spiritual gestures in a re-creation of the never-ending dance of revelation, so that as the dancing figure whirls horizontally across the floor around the imaginary pole that symbolizes the projected heart (the solar ground of all being that is the metaphysical center of his orientation), the Dervish’s upward-facing right palm and downward-facing left palm together signify the sacramental attitude of his heart, delicately poised as a channel of love in between the two worlds, open simultaneously both to transcendence and immanence, to mystery and intimacy, simultaneously receiving and giving, in stillness and movement, welling up and descending in a continuous flow, as mysterious and as intimate as the Divine Breath, a cascade of Mercy and Bounty from the abundant reservoirs of the Eternal Font, from the celestial realm above to the infinite ranks of the terrestrial below.